Welcome to the first Perfect Pieces monthly newsletter. This will be a short monthly e-mail to keep you informed about interesting new stock and recent antique fairs we've been to. March has been quite a busy month with the main events for us being the Harrogate and Peterborough antique and collectors fairs. Trading was mixed at both fairs as they suffered a little from the weather, but while snow at Harrogate resulted in flakey visitor numbers on Sunday, the torrential rain (Friday) and mud (all the time!) at Peterborough didn't prevent a reasonable turnout of trade and public on both days. The beginning of April will find us at DMG's Newark International Antiques Fair. Always an interesting event, hopefully the beginning of spring will result in a good turnout of trade and public buyers. We will be standing in the Lady Eastwood hall, on the corner opposite the cafe (the same stall as last time) and will be glad to see any of you who are passing by. Our favourite find this month is definitely a very large Poole Freeform vase in the peanut or marrow shape. This 17" giant is shape 702 - the largest of the four sizes this shape was made in. This example dates 1955-59 and was decorated by Gwen Haskins in the PLC pattern. In the flesh it really is an impressive vase with the photographs not doing it justice - so in one we included a 50p coin to illustrate the scale better! Staying with Poole Freeform, we also found a smaller cousin for our giant vase. 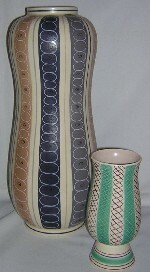 This vase is shape 703 decorated with pattern PKT by the paintress Pam Burgess who worked at Poole Pottery from 1953 to 1958. Click here to see more of this elegantly shaped Freeform vase. Both the pattern and shape of this vase are Alfred Read designs, and in comparison to our huge marrow vase of 17" tall this vase is a mere 7.5" tall! The Alfred Read & Guy Sydenham designed Poole Pottery Freeform range of the 1950s still looks very fresh and stylish to my eyes, and an increasing number of collectors seem to agree - our Freeform sold well at Peterborough and the regular Freeform buyers we have between them span the generations, such is the broad appeal Freeform seems to have. That's all for this edition of our newsletter, thanks for your interest, and as always if there is something you would like to see featured in this newsletter, or something you are particularly looking for, drop us an e-mail and we will do our best to help.